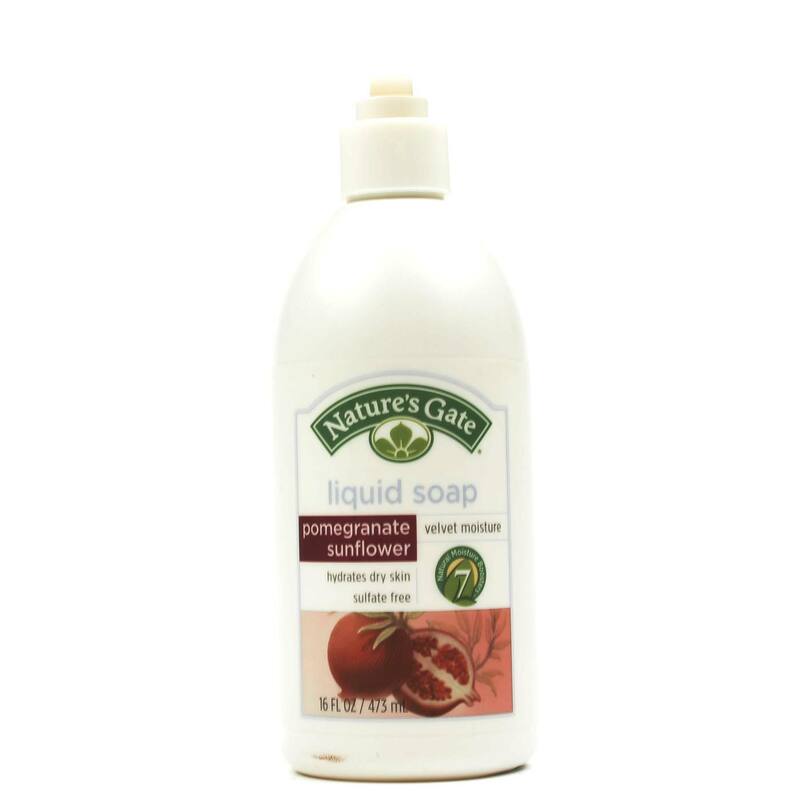 Hydrate and cleanse your skin with the natural power of Liquid Soap from Nature's Gate. With a combination of nourishing ingredients--like shea butter, sweet almond oil, sunflower extract and vitamin E--this product works to hydrate skin and replenish moisture naturally. 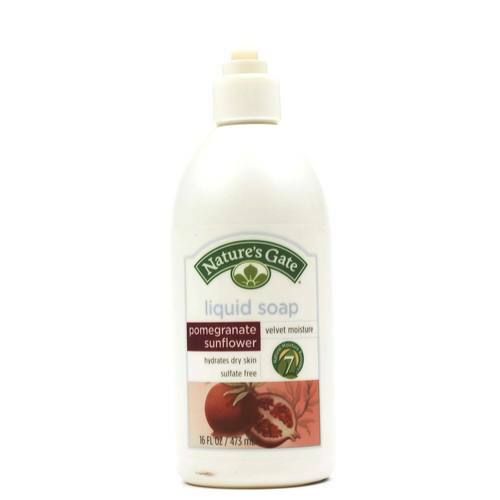 Liquid Soap from Nature's Gate contains pomegranate and acai, which provide antioxidant properties and can help fight free radical damage while smoothing and softening skin. 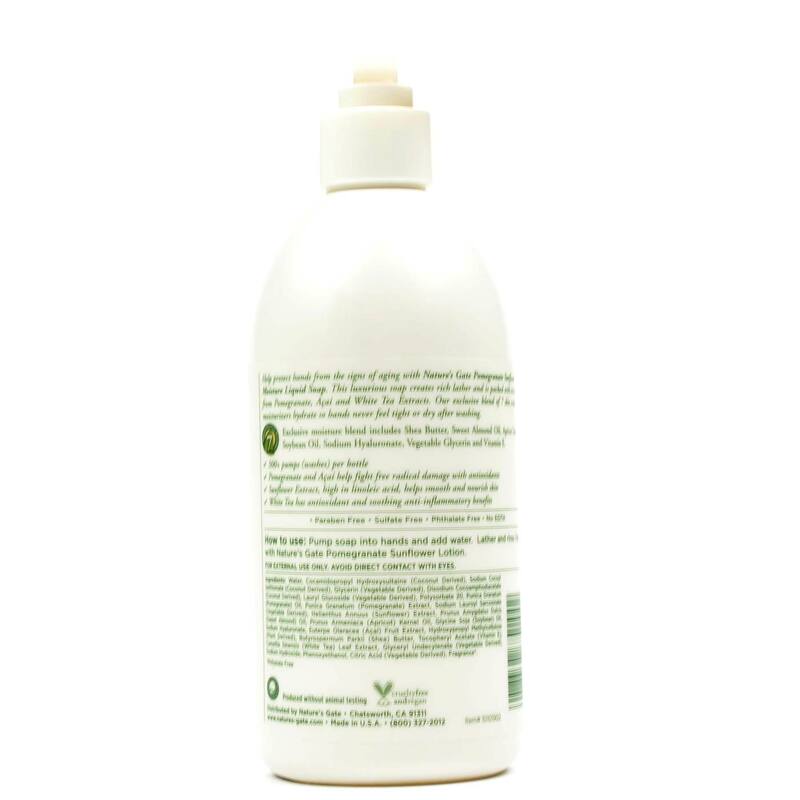 Liquid Soap from Nature's Gate can help hydrate and cleanse your skin the natural way. Get it today at eVitamins for a great price! 警告: For external use only. Avoid direct contact with eyes. 注意事项: Paraben Free. Sulfate Free. Phthalate Free. Cruelty Free and Vegan. Produced without animal testing. Ingredients: Water, Cocamidopropyl Hydroxysultaine (Coconut Derived), Sodium Cocoyl Isethionate (Coconut Derived), Glycerin (Vegetable Derived), Disodium Cocoamphodiacetate (Coconut Derived), Lauryl Glucoside (Vegetable Derived), Polysorbate 20, Punica granatum (Pomegranate) Oil, Punica granatum (Pomegranate) Extract, Sodium Lauroyl Sarcosinate (Vegetable Derived), Helianthus annuus (Sunflower) Extract, Prunus amygdalus dulcis (Sweet Almond) Oil, Prunus armeniaca (Apricot) Kernel Oil, Glycine soja (Soybean) Oil, Sodium Hyaluronate, Euterpe oleracea (Acai) Fruit Extract, Hydroxypropyl Methylcellulose (Plant Derived), Butyrospermum parkii (Shea) Butter, Tocopheryl Acetate (Vitamin E), Camellia sinensis (White Tea) Leaf Extract, Glyceryl Undecylenate (Vegetable Derived), Sodium Hydroxide, Phenoxyethanol, Citric Acid (Vegetable Derived) and Fragrance. Directions: Pump soap into hands and add water. Lather and rinse. Follow with Nature's Gate Pomegranate Sunflower Lotion.